Japanese scientist Yoshinori Ohsumi was awarded this year's Nobel Prize in medicine on Oct. 3, for discoveries related to the degrading and recycling of cellular components. (by Alastair Wanklyn, Japan Times) – Japanese microbiologist Yoshinori Ohsumi on Monday won the 2016 Nobel Prize in physiology or medicine for his work on cell autophagy, a process that helps the body remove unwanted proteins. 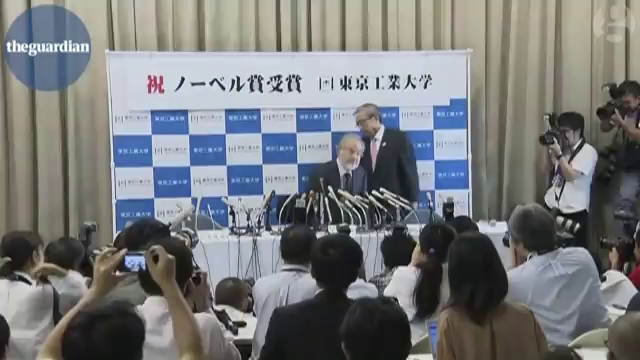 Ohsumi told Japanese public broadcaster NHK he felt “very honored” when he heard the news. His work, he added, was driven by the desire to do something unique. [Ohsumi, who is 71 and now serves as professor emeritus at the Tokyo Institute of Technology, called the prize the “greatest source of joy and pride” for a scientist.] [He said he chose to focus on the cell’s waste disposal system, an unfashionable subject at the time, because he wanted to work on something different. “I don’t feel comfortable competing with many people, and instead I find it more enjoyable doing something nobody else is doing,” he added. “In a way, that’s what science is all about, and the joy of finding something inspires me.”] [“Looking into bodily processes, I found that we have an ongoing renewal process without which living organisms can’t survive,” Ohsumi told NHK shortly after the announcement. 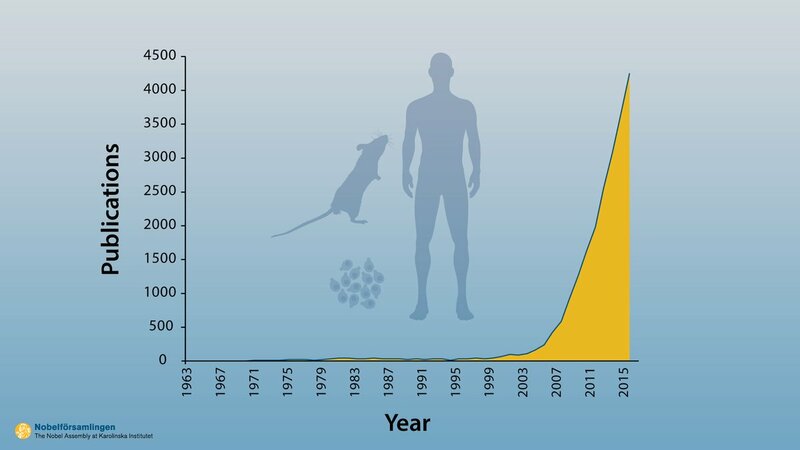 “This recycling process did not receive as much attention as it deserved, but I discovered that we should be paying more attention to this autophagy process,” he said, adding that I was “lucky” to make the discovery early on in his career. 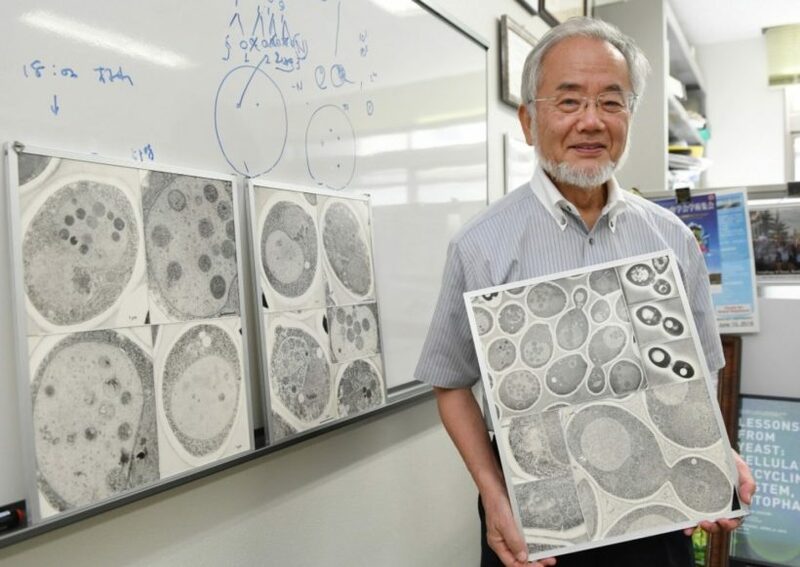 Ohsumi generated an enormous interest in autophagy and is now one of the most intensely studied areas of biomedical research. Ohsumi is the 25th Japanese to win a Nobel Prize, including individuals who later obtained citizenship of other countries, and he is the fourth to win the medicine prize. Ohsumi is expected to attend the Nobel awards ceremony Dec. 10 in Stockholm, where he will also receive a prize of 8 million kroner (¥95 million) [$935,000]. [Last year’s prize was shared by three scientists who developed treatments for malaria and tropical diseases. It was the 107th award in that category since the first Nobel Prizes were handed out in 1905. Predicting the winners is a game of chance…the selection process is nothing if not opaque. Shortlists are never released. Nominees only become known if their supporters announce their submissions. Compiled from a news story by Japan Times with information from The Washington Post. Reprinted here for educational purposes only. May not be reproduced on other websites without permission from JapanTimes .co.jp. 1. Who won the Nobel Prize for medicine this year? 3. What did Japanese microbiologist Yoshinori Ohsumi discover in his research? Be specific. 5. What led Mr. Ohsumi to conduct this research? 7. How does Yoshinori Ohsumi’s work inspire you? By studying the process in yeast cells, Ohsumi identified the main genes involved in autophagy and showed how the proteins they code for come together to build the autophagosome membrane. He later showed that a similar cellular recycling process occurs in human cells – and that our cells would not survive without it.